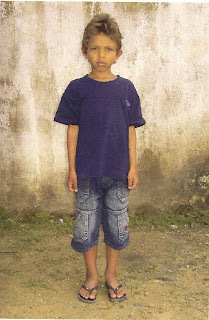 About seven years ago, at a Third Day concert, I made a decision to sponsor a child through Compassion International. It was one of those life changing things for me. For the first time in my life I felt like I had made a grown up commitment that could actually help someone other than myself. That child's name was Wilson and from the picture I received, I thought he looked like the coolest kid! And his birthday is two days before mine, which was also pretty cool. Over the last seven years, we have written each other letters and gotten to know about each others lives. I love knowing that he loves to play soccer, but is not so good at math. And that he loves when his family goes on vacation and after every letter he wrote he signed it "many hugs and kisses"! About two weeks ago, I received a letter from Compassion stating that because Wilson's family situation has improved, he is no longer in the program. I was so bummed! However, I had to realize that it's a wonderful thing! Praise God that Wilson's family is now able to sustain themselves because of the help of Compassion! In the mail today I received a packet for a new little boy that Chris and I will be sponsoring together! He is also from Brazil and his name is Hercules Alexandre:) I can't wait to see what new relationship develops between us and our new child! 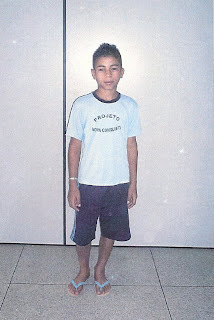 I highly encourage you to think about sponsoring a child through a program like Compassion. "Compassion International exists as a Christian child advocacy ministry that releases children from spiritual, economic, social and physical poverty and enables them to become responsible, fulfilled Christian adults." Here's a picture of Wilson. I'm gonna miss him! And here's our new little guy Hercules.